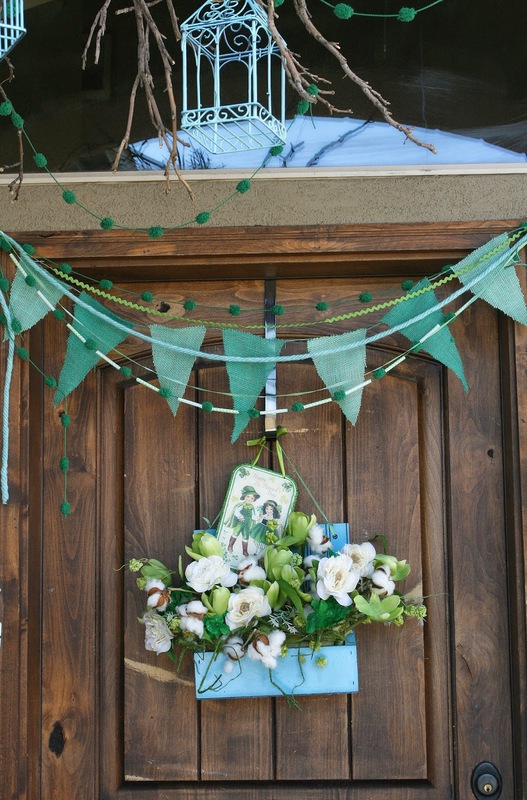 I don't know about you, but when I feel the slightest hint of spring coming on, I feel the need to bring out the GREEN. And how convenient that St Patrick's day happens in March so it's a natural time to do that! This year I decorated 3 areas in my home that are "Wearing the Green", so to speak....my porch, my kitchen island and my mantle. 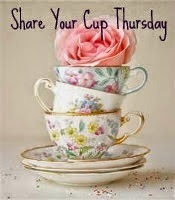 Come along for a visit! I love Aqua! I truly see it as a neutral color, like black or brown or even white. Why do I say that? Because it goes with EVERYTHING. It was fun to mix it back in with my decor for this season, and I intend to have it continue on my porch through the winter, in some form or another. 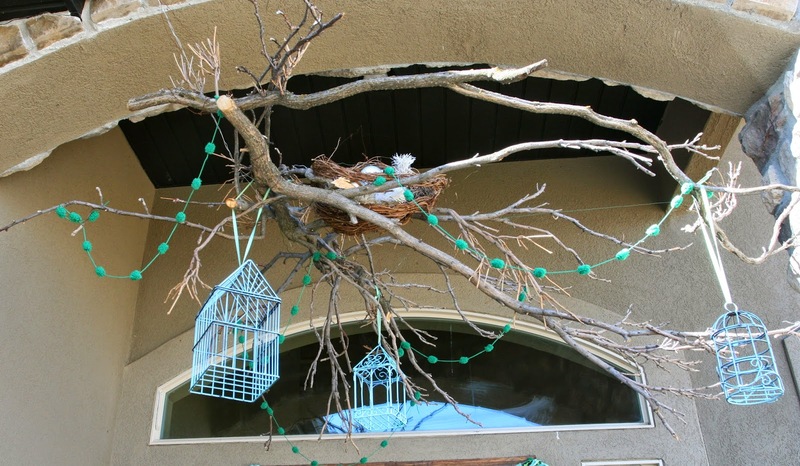 I did this twig canopy for this past Christmas, and since it survived TWO major wind storms, I decided to let it remain until after spring. 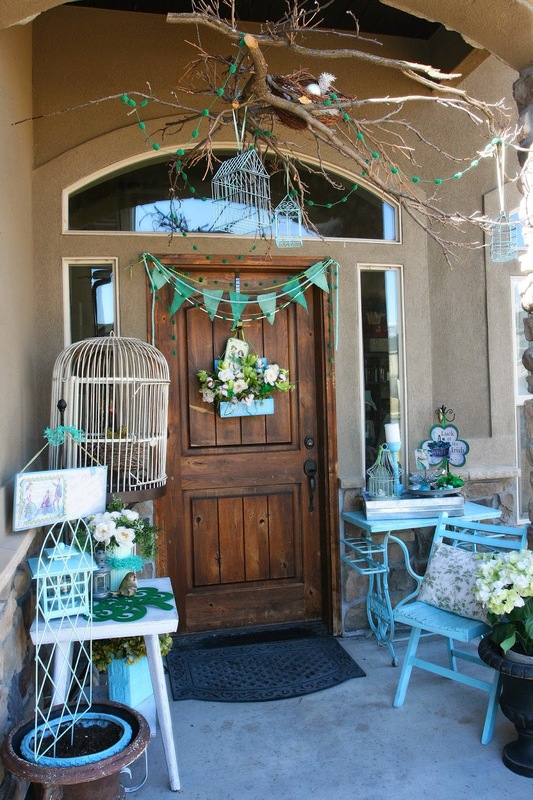 The pom-pom garlands and aqua birdhouses hanging off the branches are just so charming, don't you think? It's pretty much my favorite part of the whole design. Here are some close-ups of the remainder of my porch, and then I'll share the Kitchen Island and Mantle in another post, which I'll link here. The door "wreath" is a container I found thrifting last year, and the arrangement is one I used in previously. I just added in some green clover as well as some cream wild roses to tie in some of the other elements. I added a plaque from last year's porch to amp up the design a little. Here is last year's porch if you want to see it. 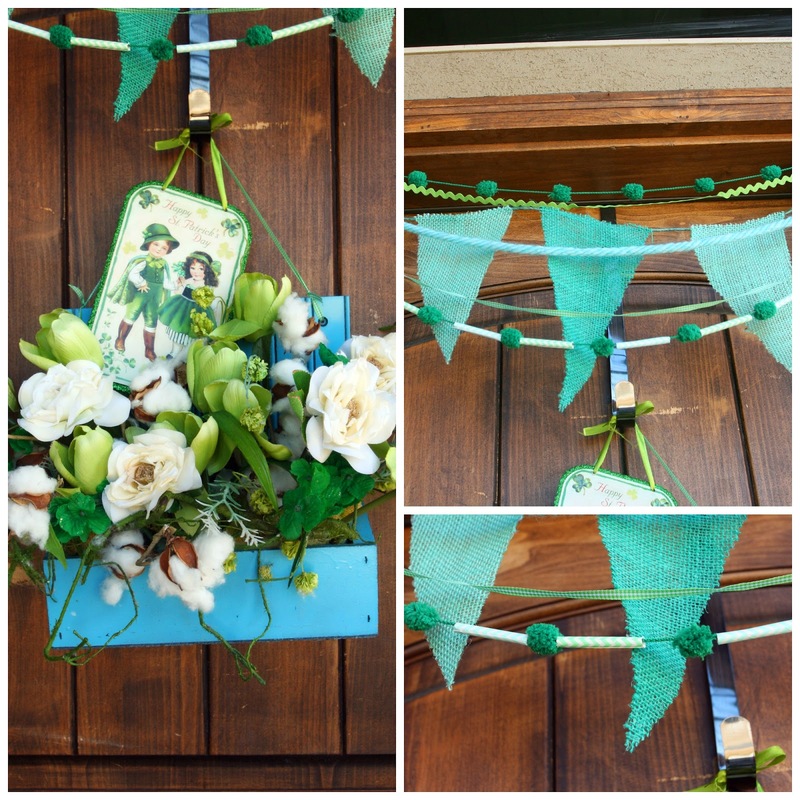 I made a mixed banner garland for over the door using simple colored jute in 2 colors, ribbons, ric-rack and a great green pom-pom garland (that I found, of all places, at a thrift store). I found a big bag of it and I have used it many times. 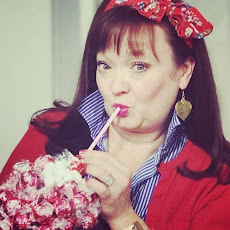 Additionally, I used some chevron-design paper straws in the porch design, and I cut some of the straws into 3rd's, and then cut lengthwise slits in them to slide over the pom-pom strand. The paper straws came into play again on this vase! I simply glued them on lengthwise onto an Oatmeal cannister! It was the exact same height as the straws, so this project took all of 8 minutes to complete! I wrapped some decorative burlap ribbon around the center to give it some extra punch. 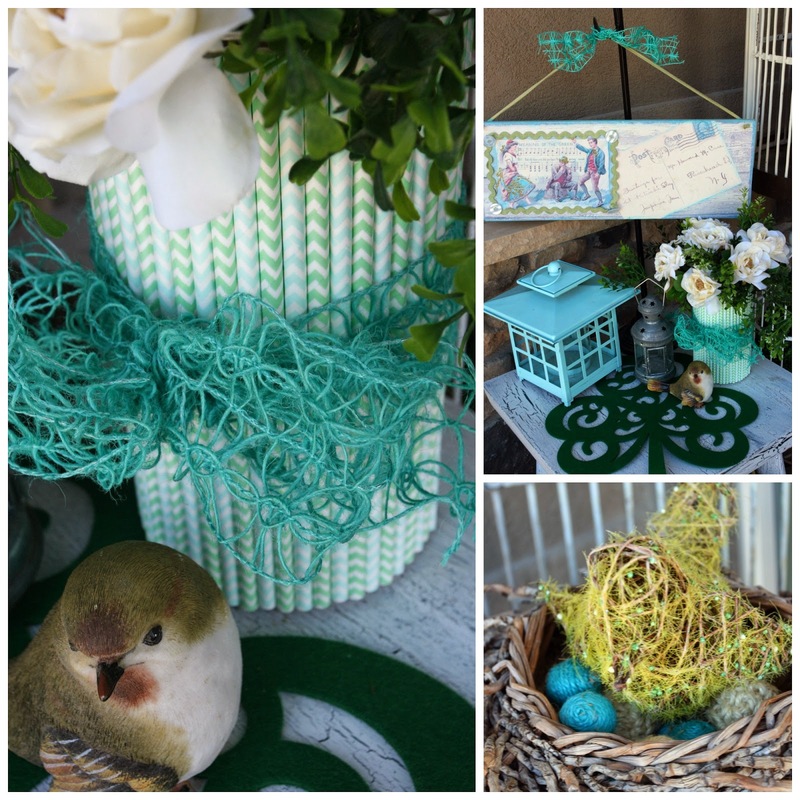 This grouping sits next to my giant birdcage, which holds a twig nest and a moss bird with jute wrapped "egg" balls. To the other side of my door, I grouped a collection of items into a galvanized tray and cake plate. One of my favorite things is my "Helping Hand" magnifying glass that I picked up at Harbor Freight. Isn't it cute with the clover shown close up? It has 2 places to clip things, so I also added a wooden plaque with a lovely little clover lady on it. 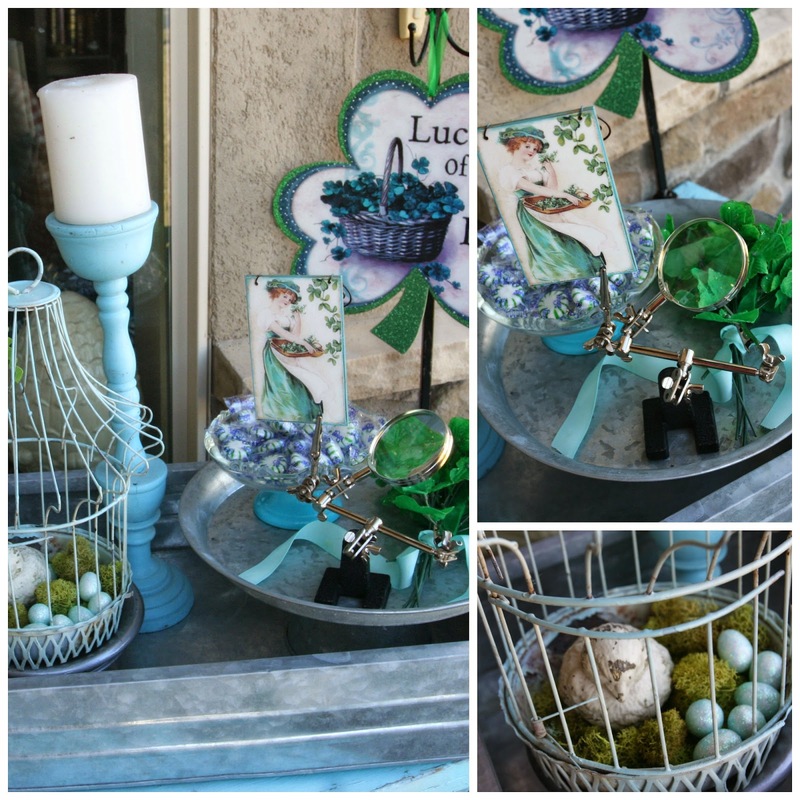 My antique aqua birdcage with little stone birdie completes the vignette (and of course some treats for visitors). My antique chair that I painted last year (with aqua...shocking, no?) and a pillow that just keeps coming back around....and my little secret...it's a piece of fabric wrapped around and duct-taped (white) on the back! 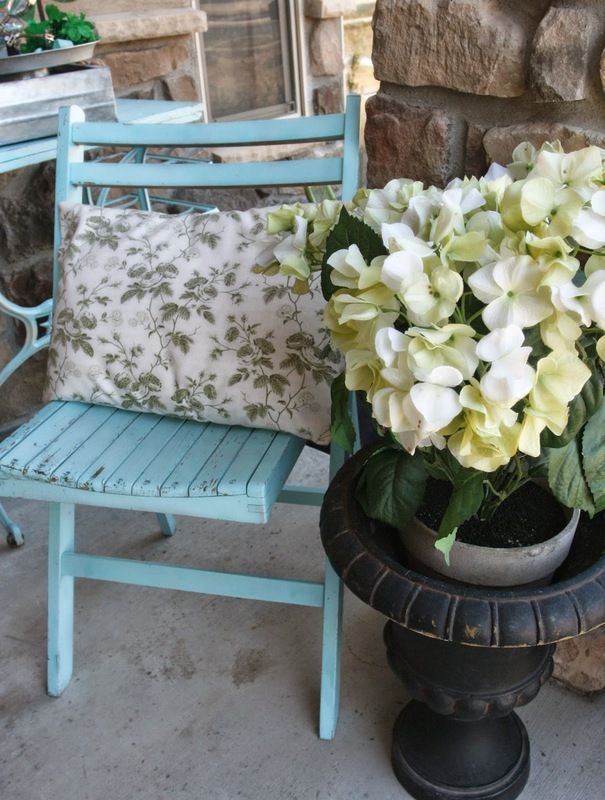 I was in too much of hurry when I used it for another porch design last year, and I've never gotten around to sewing it! Had to check out your darling porch. I too love aqua, and yes; it goes with everything! Love the twig canopy and the chair. I have a chair just like that I found at a thrift. Painted mine yellow. Thanks Jann! I know...aqua will always be a part of my life now. It's so terribly vintage I can't stay away from it's happy factor! Yellow would be darling in that style of chair!